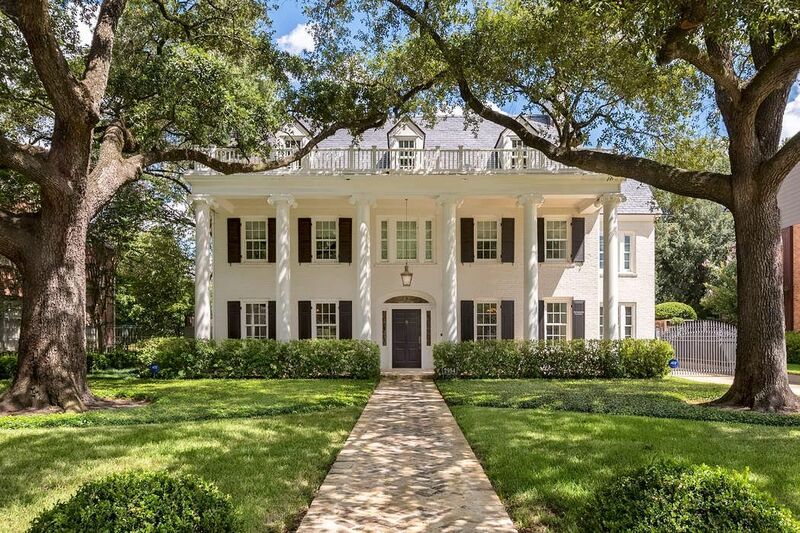 2954 Chevy Chase Drive, Houston, TX 77019 | Martha Turner Sotheby's International Realty, Inc.
[Front Elevation] This exceptionally refined, vintage Southern Colonial home overlooks Chevy Chase park and has been extensively renovated, updated and expanded for modern living. 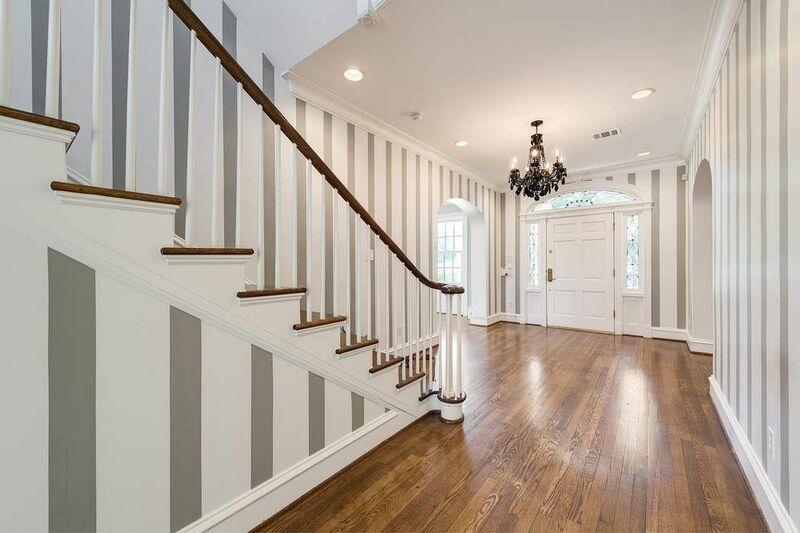 [Foyer] Past the gracefully-designed front door enhanced with sidelights and spider-web transom, the open, airy foyer divides the spacious formal rooms and transitions to French doors overlooking the rear patio and yard. 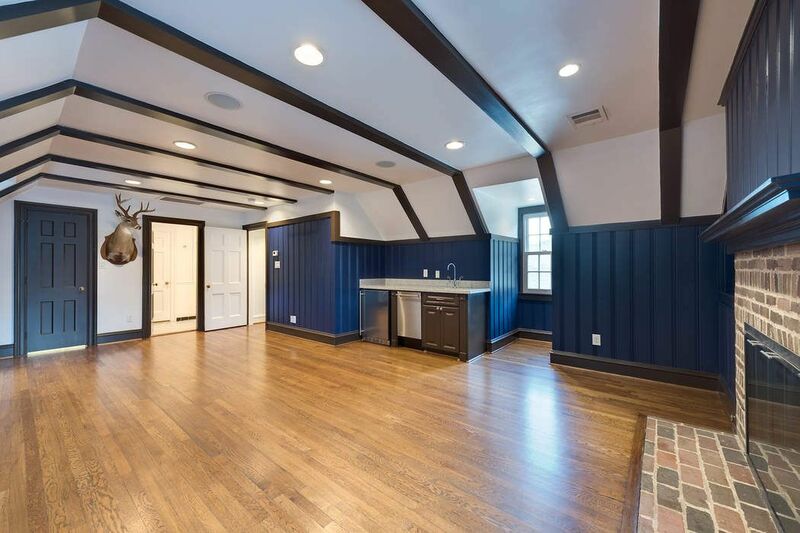 Dining room is at left. [Foyer] Reverse view of the foyer reveals the classically-styled front door. 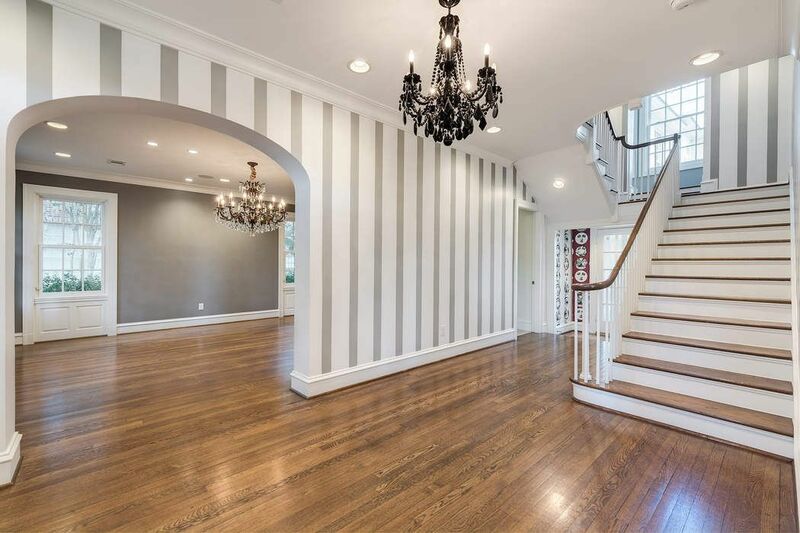 Arched opening at left leads into the living room. 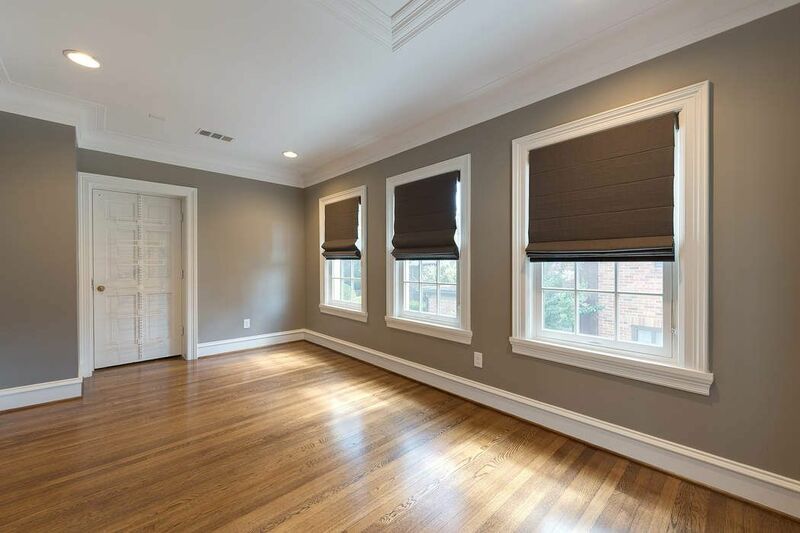 [Living Room 26x14] The living room features original hardwood floors, wainscot, paneling, and a brick fireplace. 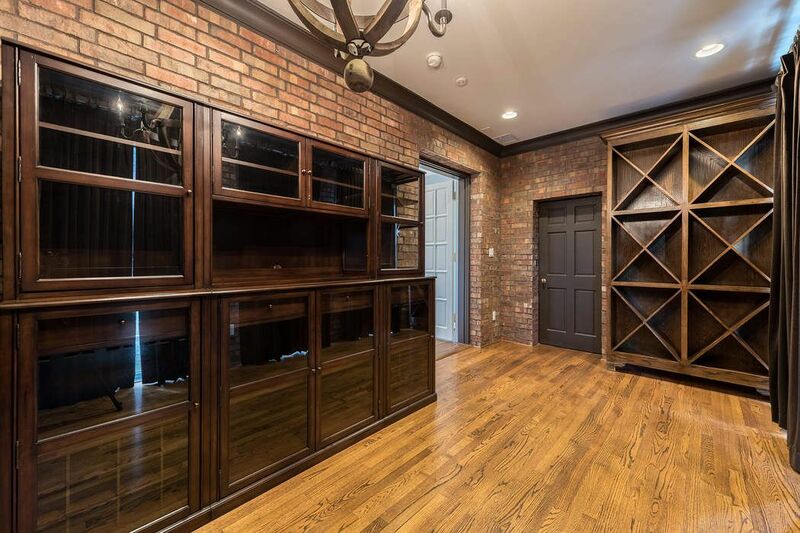 [Wine Room (16x9] Originally the sun room, the wine room offers brick walls, tall windows and elevator access. 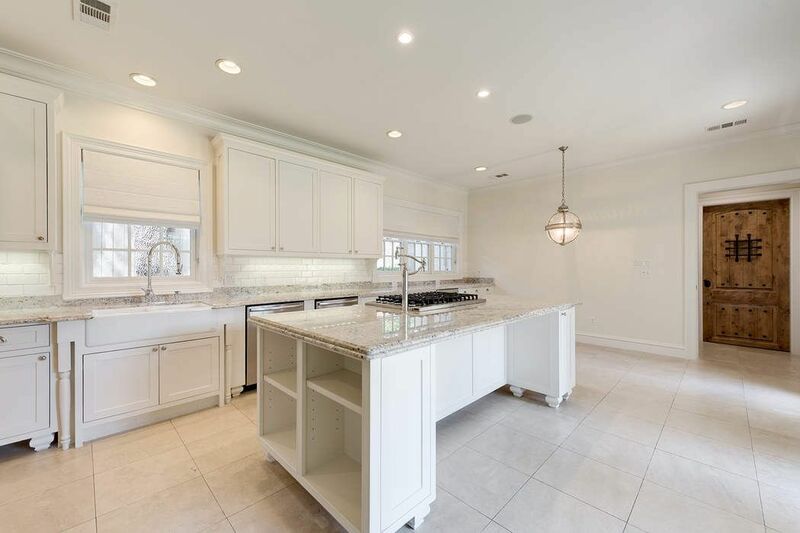 [Kitchen (15x13] Professional-grade appliances, including a SubZero refrigerator/freezer and Viking range and ovens, distinguish the light-filed gathering kitchen and breakfast area. 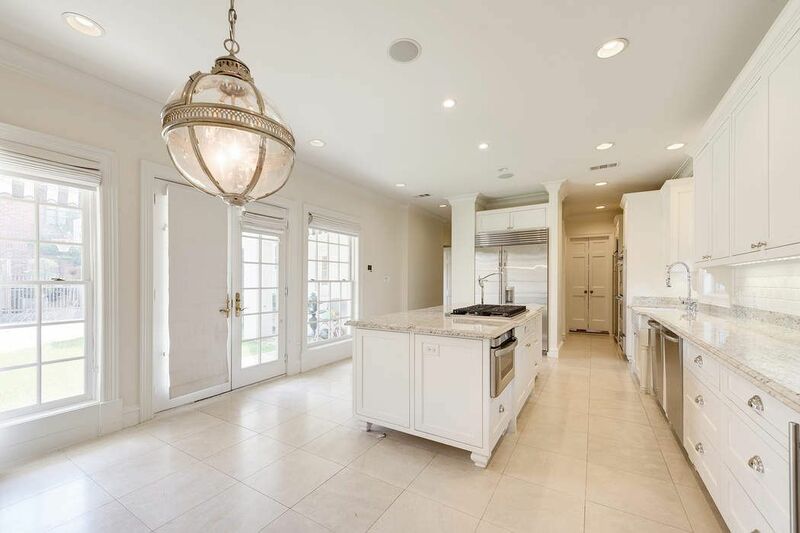 [Kitchen ] Overlooking the patio and yard through French doors, the light-filled kitchen offers a travertine floor; beveled granite countertops on the island and side cabinets; a porcelain undermount sink; and white subway tile backsplash. 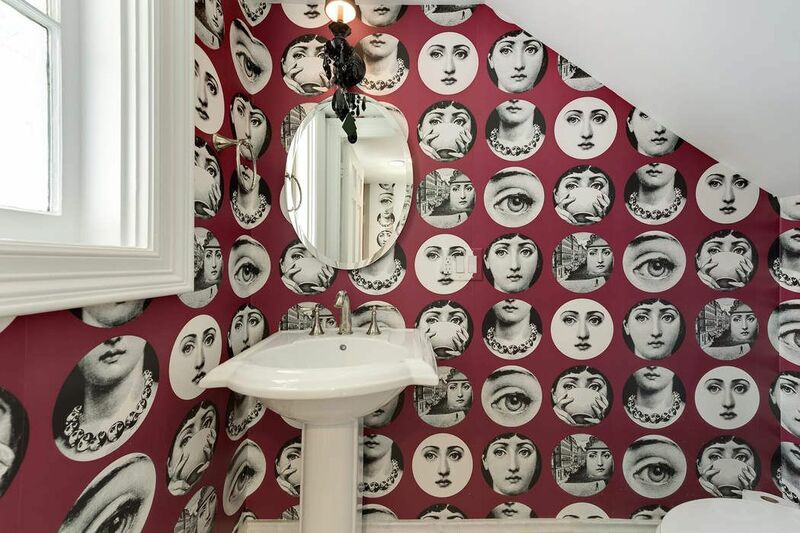 [Powder Bath] Charming powder bath located beneath the main staircase has whimsical designer wallpaper and pedestal sink. 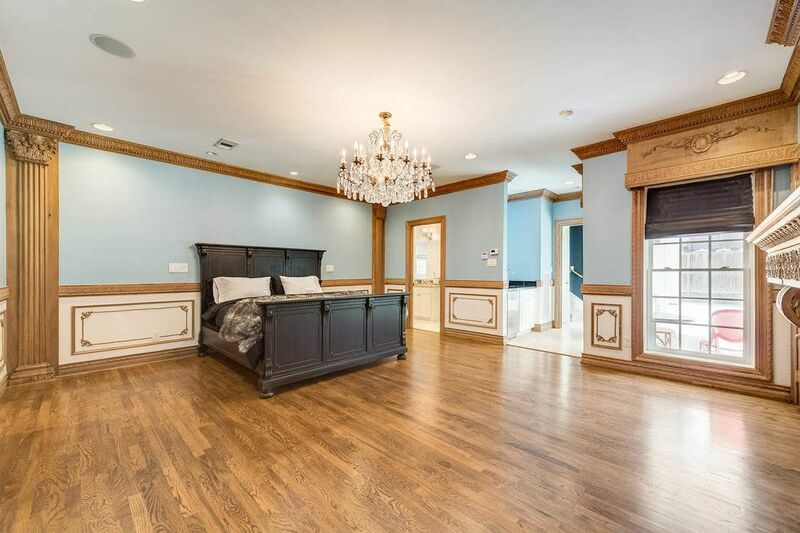 [Master Bedroom 19x17] One of two possible master suites, this bedroom occupies a secluded position on the first floor. 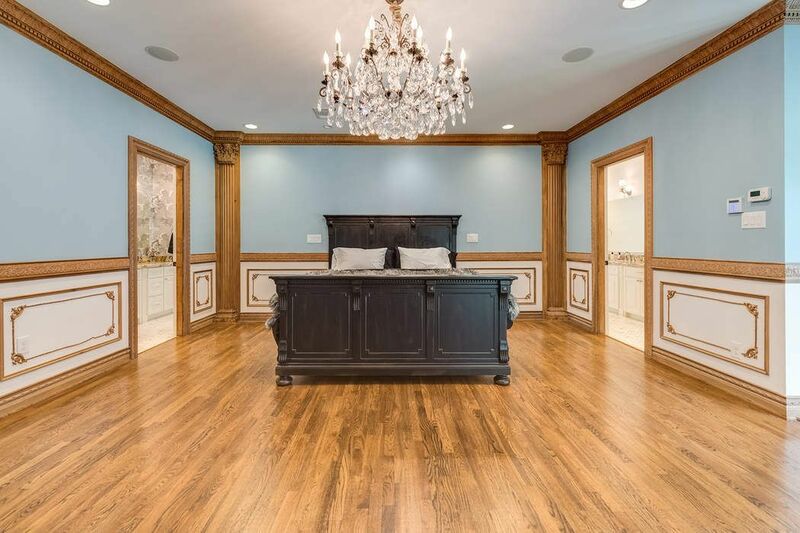 Enhanced with French-style paneling and an elaborate faux fireplace mantel. [Master Bedroom] Second view of the master bedroom reveals the entrances to the two full marble and granite-clad bathrooms and custom-fitted closets. 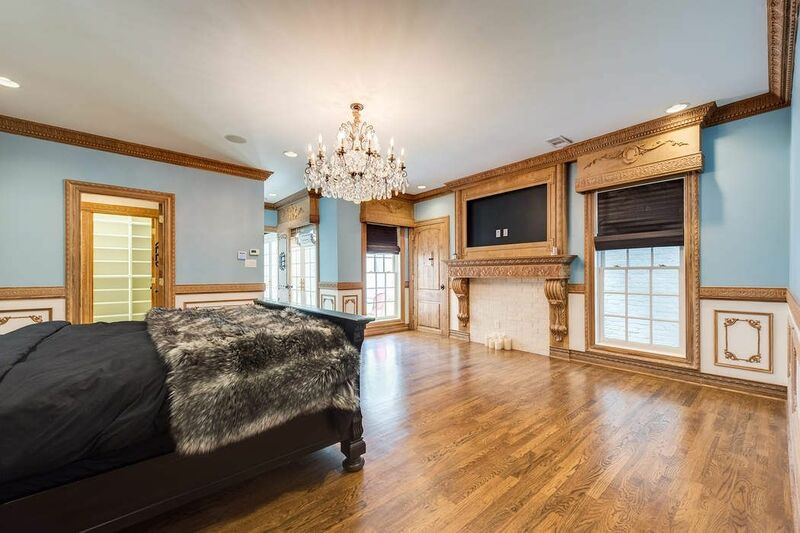 [Master Bedroom] A magnificent antique fireplace mantel with a framed space for a flat-screen television anchors one wall in the master bedroom. 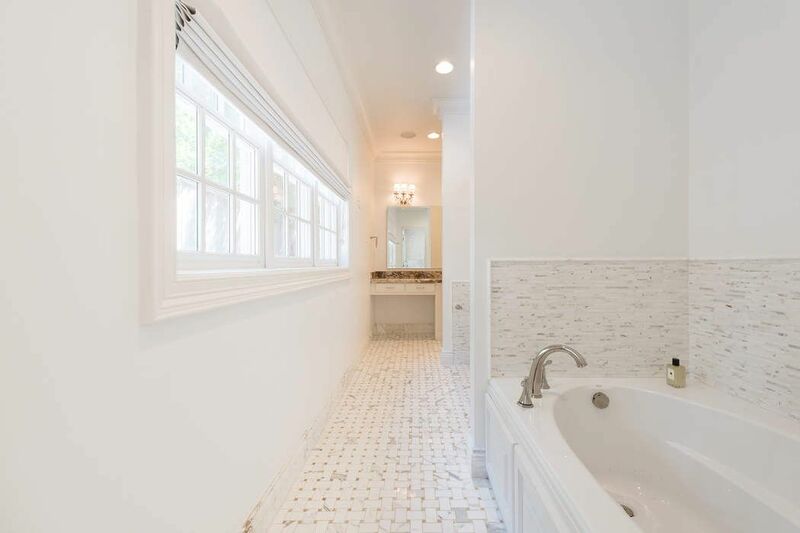 [Master Bathroom #1] View into master bathroom # 1 focuses on the air tub and basket- weave patterned marble-tiled floor. 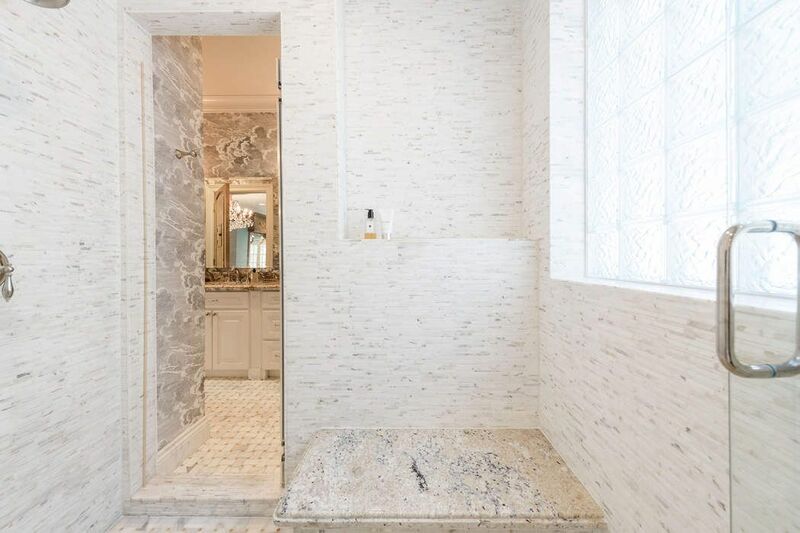 [Double-Entry Shower] The two master bathrooms connect through the oversized, marble-clad, double-entry shower. 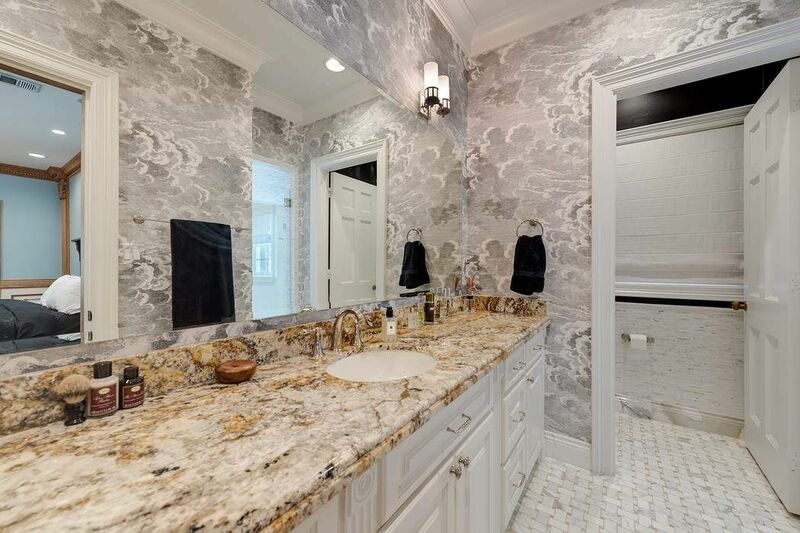 [Master Bathroom 2] Master bathroom 2 features a granite-decked sink cabinet, water closet, custom wallpaper, and a custom-fitted closet. 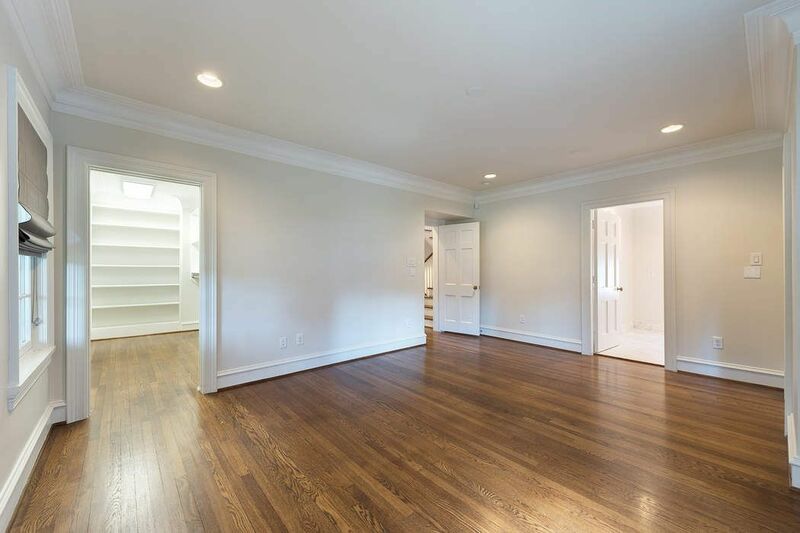 [Bedroom 17x13] Large, airy secondary bedroom offers a custom-fitted walk-in closet and en suite bathroom. 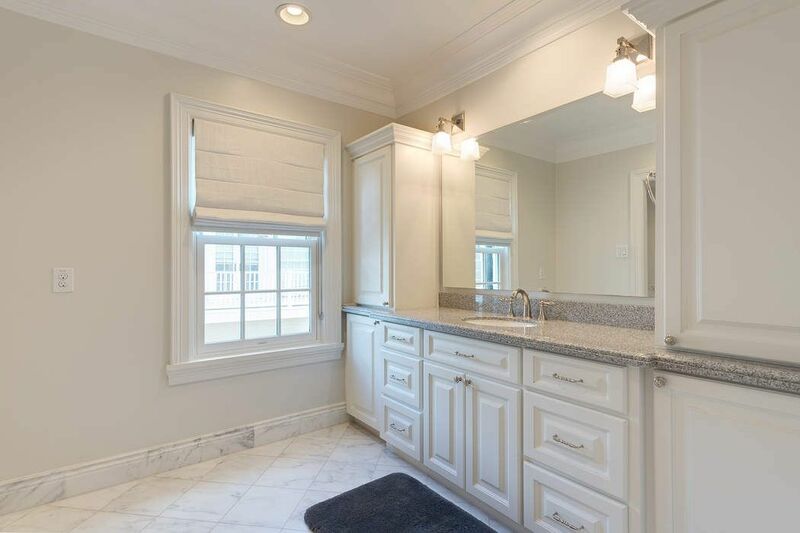 [En Suite Bathroom] Lavishly appointed with granite sink deck. marble-tiled floor. 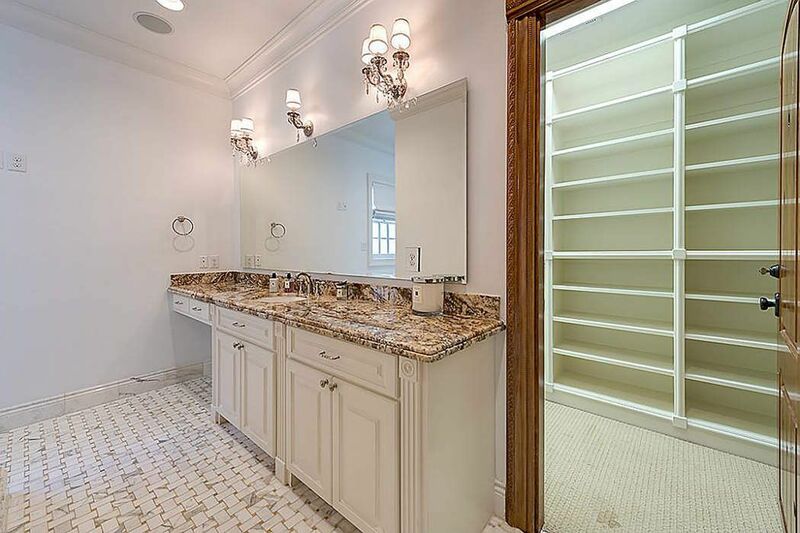 [Bedroom 3 16x13] This secondary bathroom is en suite. 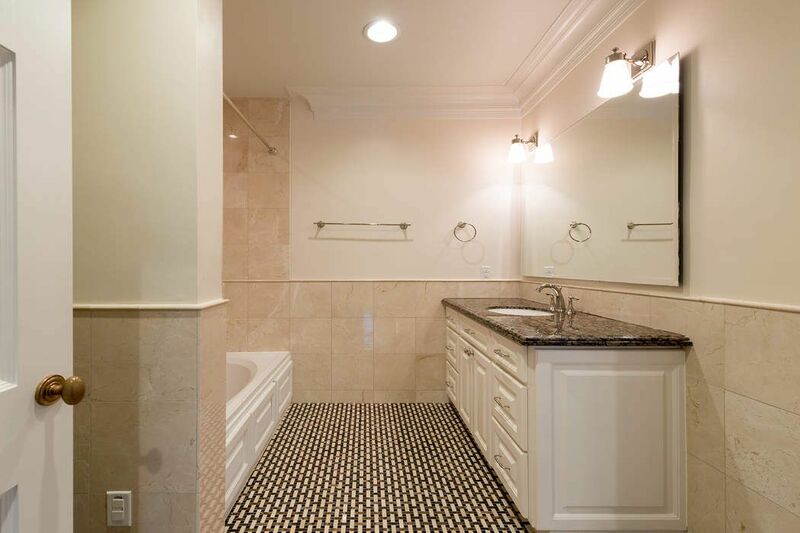 [En Suite Bathroom] Note basket-weave patterned marble-tiled floor, granite sink deck. [Staircase Landing/ Mezzanine] The staircase landing on the mezzanine opens into a light-filled study with floor-to-ceiling book/display cases. [Study 13x13] The study overlooks the patio and yard. This view reveals the entry to the adjoining full bar with black granite floor. 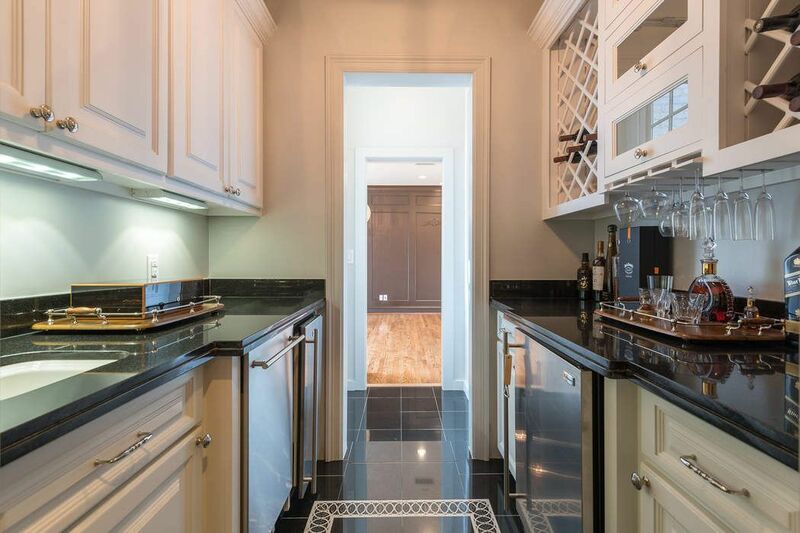 [Bar] Elegantly-appointed bar connects the study to the media room.Features include an ice maker, dishwasher, under-counter refrigerator, and wine-rack storage. 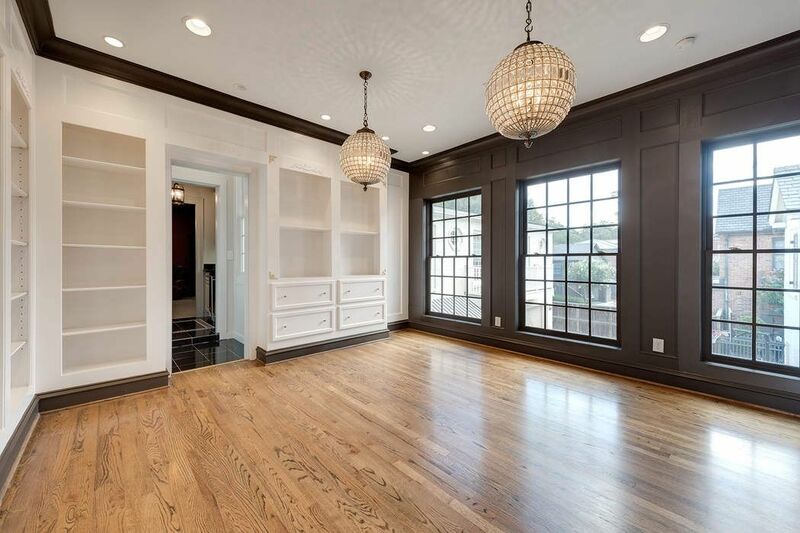 [Media Room] The media room provides a wall mount for a flat-screen television and an adjoining half bathroom. 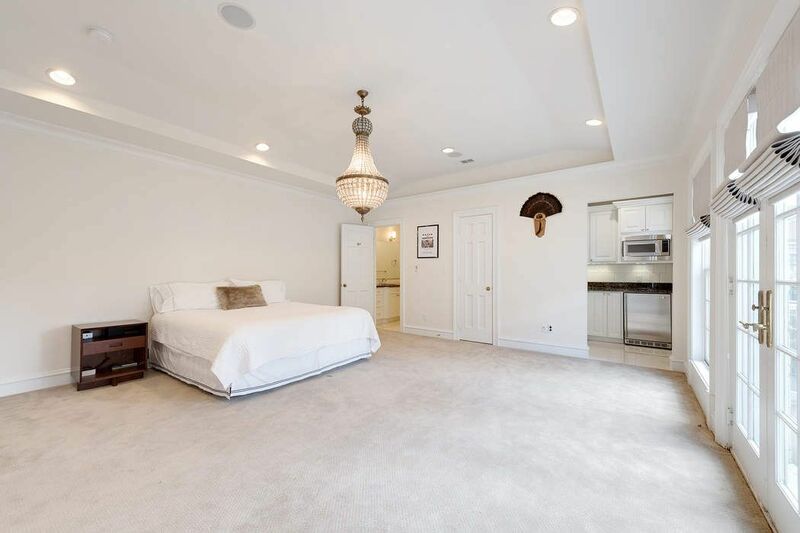 [Possible 2nd Master or Guest Suite 18x17] Positioned at the head of the return staircase and adjoining the media room, this large bedroom suite offers an attached marble-clad bathroom (left); custom-fitted closet, and a juice bar (shown at right). 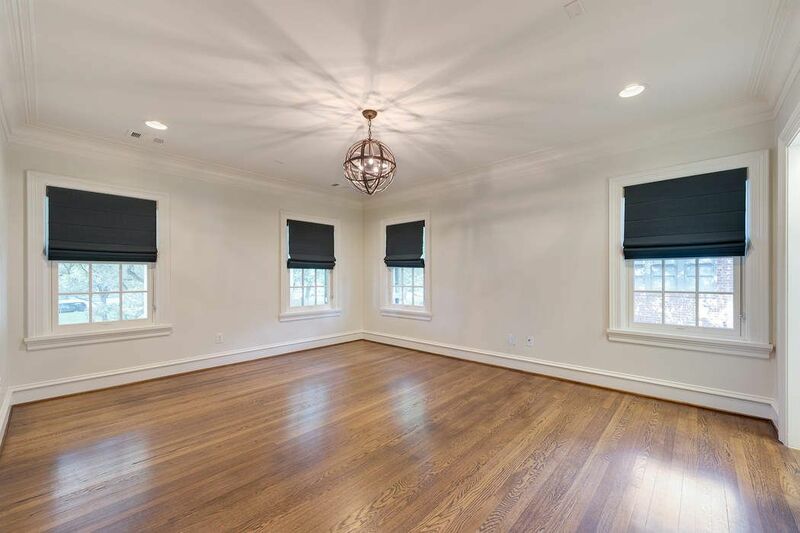 [Game Room/ Bedroom 24x11] Located on the third floor, the spacious gameroom features a full bathroom, full bar, raised beamed ceiling, dormer windows and window seats, and a custom-fitted closet. 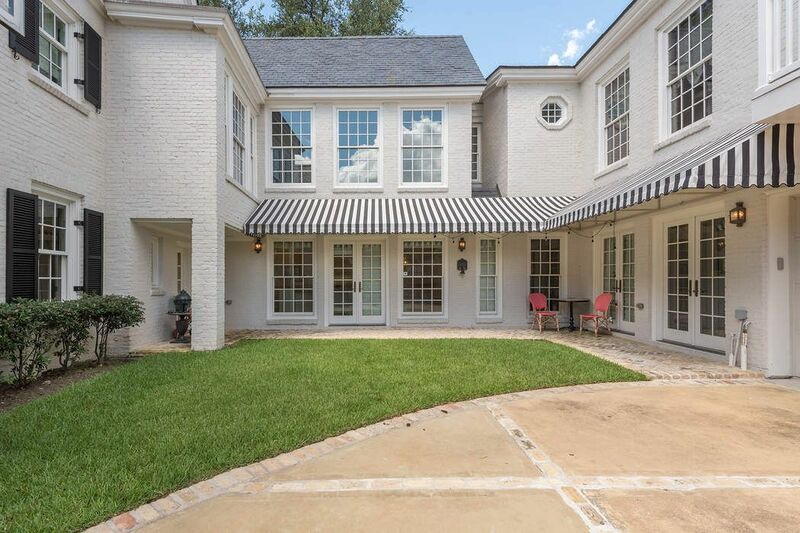 [Rear Elevation] Sheltered brick patios surround the lawn at the rear of the house. 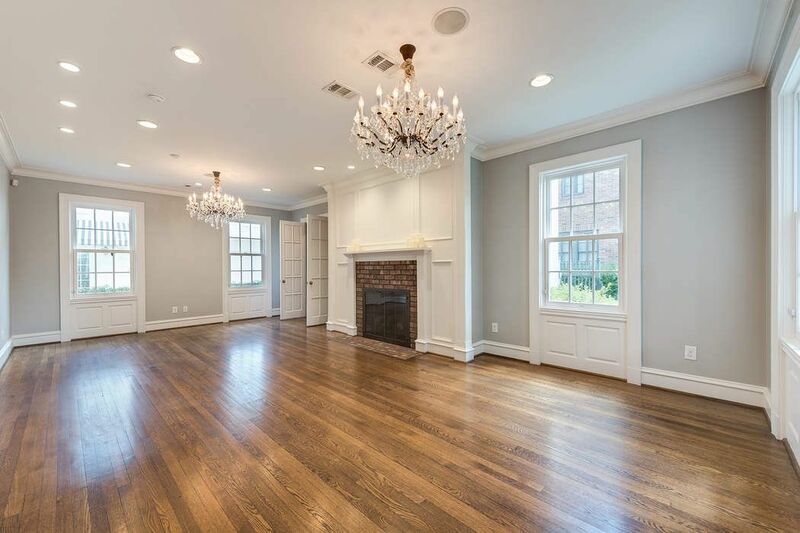 $3,750,000 5 Bedrooms6 Full / 2 Partial Baths7,479 sq. 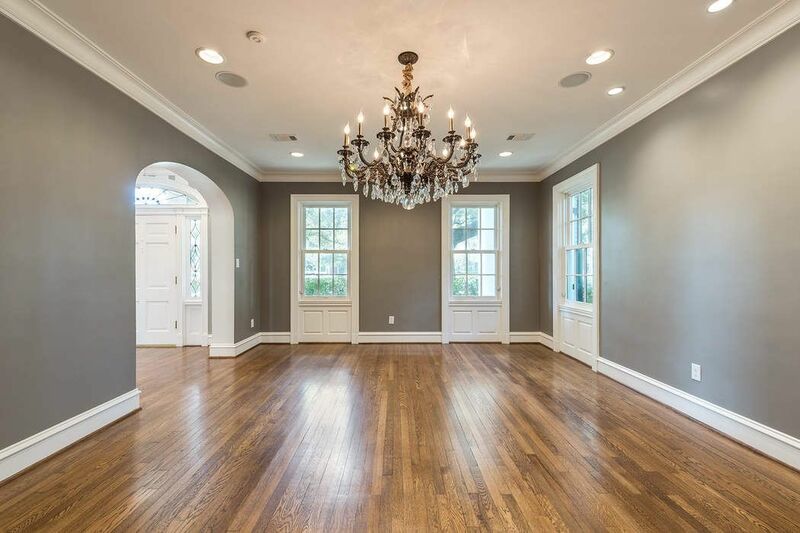 ft.
Renovated, updated and expanded while preserving the classic southern colonial façade. Premier position on Chevy Chase Park. 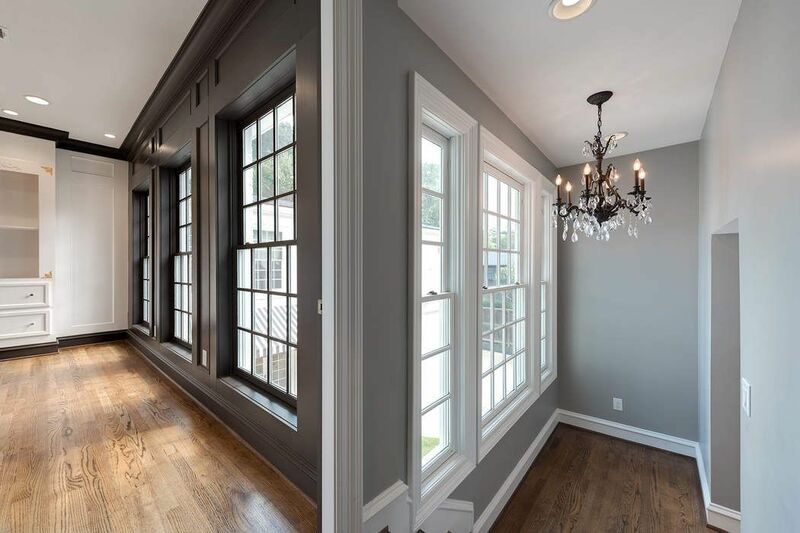 Open, airy floor plan with hardwood floors, designer wall treatments, tall ceilings, magnificent designer tile floors in baths, travertine floor in kitchen, elevator and return staircase. 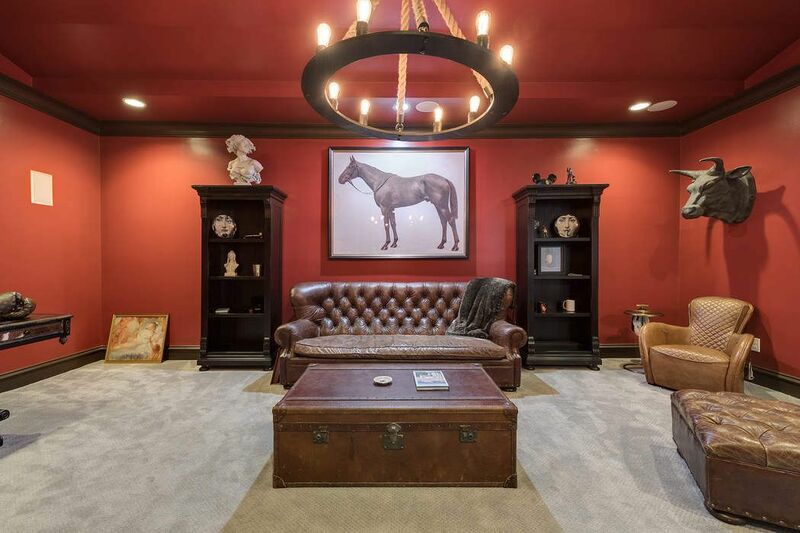 Impressive entertaining/gathering spaces. Finished third-floor with bath. Views of patio and yard through banks of French doors. Bedrooms are en suite, including two master suites.